As a full-time office worker, we spend most of our day sitting behind a desk in front of a computer monitor. Such routine gradually causes bad habits in our posture and body position, which, in turn, can cause back pain or knee pain. Well, we can’t change the daily routine that we have to undergo, but we can certainly improve it. Perhaps, you have heard about the balance ball used in yoga practices; this balance ball helps you to fix the flaws on your posture and body position. However, we may not be able to dedicate enough time for yoga, or at least not regularly. So, what should we do in order to free ourselves from the pain? Well, why don’t you use the Gaiam Balance Ball Chair instead? Gaiam Balance Ball Chair is a specially designed chair that incorporates a balance ball for the seat. It has been designed to substitute your hard, uncomfortable office chair. By using this balance ball chair as your office chair, you will be able to fix your posture and the flaws on your spine shape while you are working in the office! Killing two flies with a single smack…. The difference between sitting on regular chair and sitting on a balance ball is that your body will respond to the instability of the balance ball, forcing your muscles and spine to work in order to keep your balance. Well, it will not give you six-pack abs, but it will definitely improve your body posture and strengthen your spine as well as your core muscles, given that you use it on a regular basis. Another benefit of Gaiam Balance Ball Chair is that it forces you to stay focused. You need to focus in order to sit on the balance ball. This way, you will also find yourself more aware and less sleepy in dealing with your job. Gaiam Balance Ball Chair requires some assembly in order to be used, but the overall process is easy and simple. The directions are very easy to follow, and you only need a single tool to make it stand. You can finish the assembly as short as five minutes. Just don’t forget to re-inflate the balance ball once or twice in the first few days to help the ball achieve the optimum flexibility. 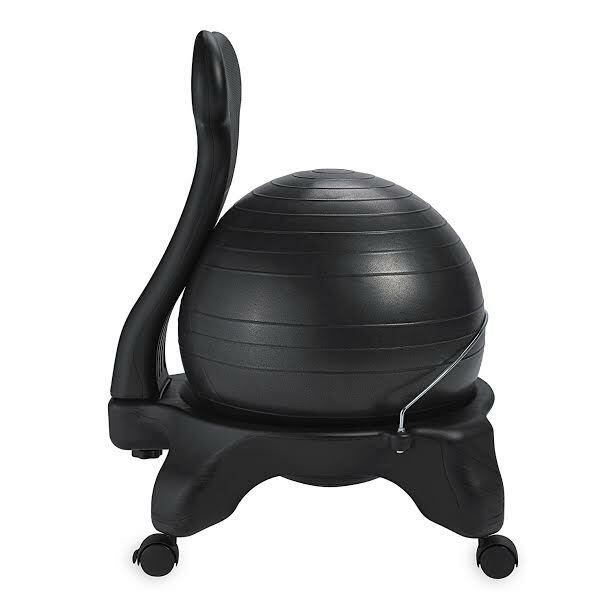 Gaiam Balance Ball Chair comes with a durable anti-burst 52-cm balance ball. You can feel that the balance ball has a strong and rugged membrane that is very unlikely to break, ensuring optimum safety. By the way, the product is available in various colors; there are at least 9 color choices from black, grey, blue, ocean, forest, green, wasabi, fuchsia, and purple. With these color choices, you can choose the one that suits your taste best. The base is lightweight yet sturdy, made from a molded PVC material. Another key part of the chair is the ergonomic back support. The back support has a spinal alignment that helps to improve your spine shape. Under the chair are lockable caster wheels that make it easy to glide from one edge of the table to the other. Sitting on Gaiam Balance Ball Chair is actually fun. It is bumpy, and that’s nice. However, the first few times sitting on it can be quite uncomfortable due to you are not used to the chair yet. You can take a break every 30 minutes or so to stand up and stretch – this will make a big difference in your comfort level. Check the best price of Gaiam Balance Ball Chair here!